A flagpole commemorates the 75th Anniversary of the landing in Gallipoli in April 1915 during World War One.. The flagpole and plaque now form part of the Innisfail cenotaph. 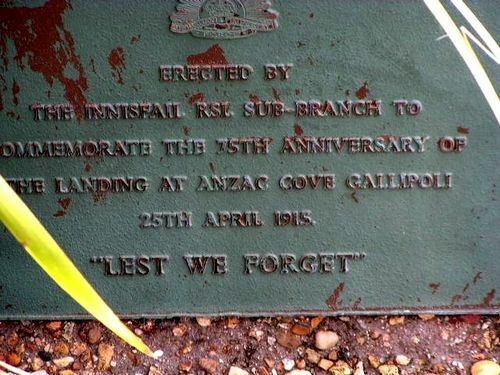 Erected by the Innisfail RSl Sub-Branch to commemorate the 75th anniversary of the landing at ANZAC Cove Gallipoli 25th April 1915.